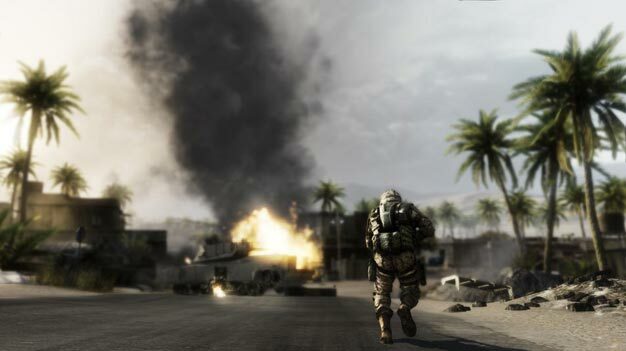 Battlefield: Bad Company 2 players on PC and Xbox 360 may be in for rough waters today; possible server outages and/or lag may occur as the game gets another round of updates, the official Battlefield blog warns. Like the PS3 update last week, the patches are being rolled out in preparation for the upcoming VIP Map Pack 7 and the Vietnam expansion, both of which were dated a few hours ago. Steam will apply the approx. 2.5GB whopper automatically while other PC users can grab it here (direct *.exe link), here, here or here. Xbox 360 users will get a prompt to update as usual. A number of fixes and gameplay changes are included in the update as well, find the deets for each system below. – Acog and Red dot scope now equippable on MK-14 and G3. – Added Ticket Count for Conquest end of round. – Added the server info to the objectives screen. – Fixed a bug on PC where the G3 would do less damage than intended. – Reduced VADS push back and damage to balance it with the ZU23. – Fixed a bug where Vehicle Countermeasures would fail to remove tracer darts at high speed. – Reduced the reload time for Vehicle Countermeasures. – Slightly increased the AT4’s damage vs armor to emphasize its anti vehicle role while keeping it balanced vs armor. – Increased the AT4’s top speed and acceleration so users spend less time exposed when firing. – Increased the AT4’s splash damage so it competes with other AT weapons vs infantry. The AT4 still has the least splash damage of all AT weapons. – Reduced the splash damage of the Carl Gustav to bring it in line with other explosive weapons. The Carl Gustav still has the most splash damage of all AT weapons. – Increased the 1 shot kill range of the M95 body shot to counter its lower rate of fire. – Reduced all weapon damage to the MCOM by 50%. – Fixed a C4 vs MCOM exploit on Atacama Desert. – Fixed a bug with FOV when aiming the M1911. – Lowered the close range damage of the AN94 to highlight its long range role. – Increased the accuracy of the F2000 on the move to highlight its role as a mobile AR. – Increased the close range damage of the shotguns to give them a greater advantage vs slugs. – Slightly lowered the damage of the M60 to balance its accuracy advantage vs other LMGs. – Slightly lowered the damage of the MG3 at close range to balance it with other high rate of fire weapons.